This modern arm chair offers a more comfortable take on contemporary style. 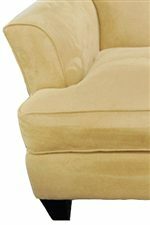 Flair tapered arms frame either side to create a supportive armrest that doesn't sacrifice style. A plush seat and back cushion combine to provide plenty of comfort. Welt cord trim and tapered wood feet complete the chair's intriguing style. Shown in Kensington Bisque, this style is available in an array of upholstery coverings. The 103A Contemporary Chair with Tapered Legs by Bauhaus at AHFA in the area. Product availability may vary. Contact us for the most current availability on this product.